PulpEye has now reached the milepost of 50 units sold as Ahlstrom-Munksjö Aspa Bruk in Sweden invests in a PulpEye system for pulp analyses online. Bleached and unbleached kraft pulp is produced at the Aspa mill and the PulpEye they have acquired contains modules for determination and measuring of kappa number, brightness, dots and pH. 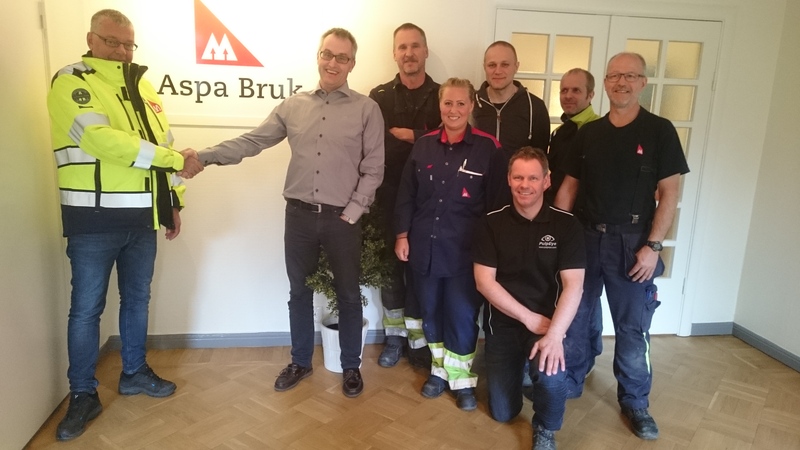 Jonas Pettersson-Hagel, Ahlstrom-Munksjö Aspa Bruk, and Öjvind Sundvall, PulpEye, confirm the purchase of PulpEye No.50 together with colleagues from Ahlstrom-Munksjö Aspa Bruk and PulpEye. Ahlstrom-Munksjö Aspa Bruk produces bleached and unbleached hardwood sulphate pulp. This was the first mill in the world to install oxygen bleaching, already 1974 and in 1989 it was also the first mill to be able to offer 100 % chlorine-free sulphate pulp. PulpEye AB is an innovative measurement technology company, focusing on online applications and services for the pulp and paper industry globally. Main products are the PulpEye pulp analyser and the ScanChip chip analyser. Head office is in Örnsköldsvik, Sweden. PulpEye products are sold globally through sales offices and sales representatives in Europe, North America, South America, Asia and Oceania.